Bangor University has joined forces with the British Heart Foundation with their latest campaign. This year Campus Life, Student Volunteering Bangor and the Sustainability Lab will be involved in a charity initiative to stop waste going to landfill and also raise money for British Heart Foundation. 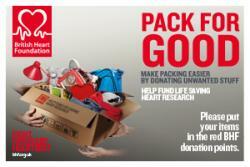 Pack for Good is a campaign to get students to donate their unwanted items to the British Heart Foundation at the end of the term and runs from now until the end of June when students will be moving out from halls. Students will be able to donate their unwanted items at various points around the St Mary’s and Ffriddoedd Halls villages by filling the donation bags provided. Donations can consist of unwanted clothes, shoes, accessories, books, bric-a-brac, CDs, DVDs, small electrical items and also non-perishable, unopened food items. Amanda Purkiss, BHF Regional Stock Generator, British Heart Foundation said: “We’re delighted to be working with Bangor University on the ‘Pack for Good’ campaign. 100% of the profits from the donations from students will go into the fight against heart disease and fund the BHF’s life saving research.